There is a general agreement on the role that peri-urban agriculture can play in achieving sustainable cities. This role is particularly crucial in the Alps, which are now the scene of relevant changes, involving above all cities that are embracing metropolitan functions. 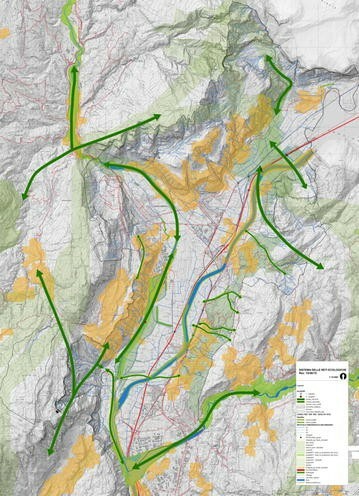 These changes pose problems, first of which being the impairment of the particular relations between urban and natural processes that form the basis of not just the sustainability, but also the same identity, of the Alpine city. In fact, due to the development of processes that are highly anomalous in mountain territories, such as urban sprawl, Alpine cities run the risk of reproducing lowland urban development. The article focuses on the way whereby the identifying traits of the Alpine city can be maintained, and not least its sustainability, pointing out that in the Alps peri-urban territories, which in many Alpine regions still present characteristics distinct from those of lowland city, can play a key role in the construction of the new urbanity suggested by the sustainable development paradigm. The peri-urban territory north of Trento, the Rotaliana Königsberg, for which a planning project was drawn up that aims to return to this territory its agro-food vocation, constitutes an evidence of the effectiveness of such approach. Remarkable aspect of the project is in the creation of a vast agricultural park that encompasses almost all this urbanized territory. Finally, the conditions are summarized which allow to achieve similar results. In the Alps there are cities which appear able to perform metropolitan functions and therefore play an important role in European-wide urban competition (Perlik et al. 2001; Dematteis 2009; Perlik and Messerli 2004) and again, dynamic places which, although unable to count on the presence of a large urban centre, nevertheless manage to perform as a city by activating precious synergies. Nevertheless, the Alpine city in performing metropolitan functions is running a risk. Cities that have managed to become part of supra-regional networks and compete in metropolitan contexts are progressively losing the characteristics that derive from being cities in a mountain territory. In fact, the appearance of new processes, such as a sprawling built-scape, the impairment of natural ecosystems and the radical transformation of the landscape, is making the Alpine city uniform to lowland metropolitan cities (Perlik 1999; Favry and Pfefferkorn 2005). Hence the suggestion from a number of authors to pursue the objective of reinforcing the urban Alpine system, but in the way that Alpine city would continue to exhibit the natural, historic, cultural, cognitive and institutional characteristics specific to the territory (Dematteis 2009; Fourny-Kober 2004), even in this new dimension. However, what in practice would this form of action involve? The distinctive characteristics usually associated with the Alpine city may in some ways appear tautological, as they consist in the fact that this city is located in the Alps (Fourny-Kober 2004; Fourny 1999). The mountain defines both its stage and its horizon, becoming the point of reference in an uninterrupted dialogue between local societies and nature. The interpenetration between city and mountain alone thus ends up by being an element of distinction for Alpine cities, which differ from other cities for their unique mixture of anthropic and natural elements. The Alpine city is thus what it is, in the sense that it constantly projects the image of a city, which cannot renounce its roots as those roots go down into an immovable natural setting. This brings comparative advantages deriving from the geographic position, natural resources, fascination of the environment and landscape and the close proximity of the settlement to vast natural spaces, as well as from the presence of open communities living in a multi-ethnic space. In other words, these are places built on a human scale, and able to exert a strong attraction on the outside world (Perlik et al. 2001). In this framework open space and, in particular, peri-urban agriculture plays a key role. Referring to other realities certain authors, as Donadieu (Donadieu 1998) have identified peri-urban agriculture (or rather, the urban countryside) as the pivot around which to make the new urban–rural relationships revolve. Other authors insist on the role peri-urban agriculture could play in providing food to cities (Viljoen et al. 2014), while, in their turn, architects and planners have started a densely-packed phase of experimentation aimed at developing an urban landscape capable of mitigating the effects of both sprawl and urban density if not of climate change (Desvigne 2009; Despommier 2011). An ample hydrographic network due on the one hand to the outcrop of the water table and, on the other, to the use of water for agriculture. 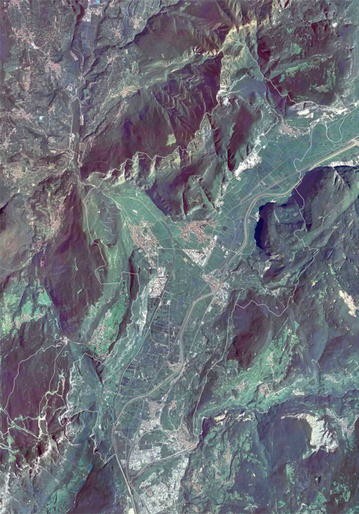 Such elements take the form of open spaces where agricultural land alternates, especially over hill land, with forest land thus contributing—and even near the cities—towards defining the landscape of both the Alpine valley floors and Alpine city, together with the high mountains and extensive forested areas. This configuration determines absolutely favourable conditions to establish virtuous relations between urban and natural processes, with special reference to the ecosystems still present in the peri-urban areas, including, in particular, agricultural land (Hough 1995; Tjallingii 2000; Diamantini 2006; Alberti 2008; Palazzo and Steiner 2012). These favorable conditions are, however, hampered by the tensions that are created, as mentioned, by the contrast between urban development and scarcity of space. The article, that extends previous studies of the author (Diamantini 2014), assumes the perspective of a city development in the Alps able to safeguard the distinctive features of the Alpine city by strengthening the quality of relations between city and peri-urban agriculture. The characteristics of the urbanization process that is taking place in the Alps and the problems it engenders are considered, focusing on both the opportunities, which call for solutions alternative to the current urban growth pattern, and the conditions for the realization of these solutions. Particularly important among these conditions is above all the reversal of the relationship between the city and the peri-urban territory, now completely unbalanced in favour of the city. Finally, reference is made to a specific case study: the territory to the north of Trento where a planning project was drawn up, with the involvement of the author (Additional file 1), aimed at emphasizing the agro-food vocation of this territory through different measures, including the creation of an agricultural park. As various authors insist, the urbanisation process that recently occurred in the Alps is quite similar to the process that occurred on the plains (Perlik et al. 2001; Perlik 1999), even in the case of urbanisation processes guided by planning schemes. And this is because, with a few rare exceptions, these urban planning schemes re-proposed the same solutions for the Alpine cities as those already adopted for cities on the plains, without taking any account of their specific characteristics (Crivelli 2010). In particular, there was a mere application of the zoning criteria with which, often arbitrarily, the various functions were spatially divided with a separation between outstanding and ordinary territorial features. As is now evident, the result was the separation of the city from its natural hinterland and the progressive loss of the distinctive characters of Alpine urbanity. Even now the Alpine region is the scene of bitter confrontation between, on one hand, a process of standardisation dictated by changed development patterns and new lifestyles and, on the other, an attention focussed on maintaining the distinctive characters of the places, including cities, not just in consideration of the consequent comparative advantages, but also because of the cultural values they express. It seems ever more evident that the distinguishing characteristic of Alpine settlements can today no longer be the simple fact of standing at the feet of the mountains which have always dictated their forms and their horizons. The widespread awareness of the value of agriculture. Peri-urban agriculture, in particular, unlike what happens in lowland cities is not relegated to residual space or gaps and practised as a supplementary or even free time activity. In the vicinity of a number of Alpine cities it is still possible to recognise a form of farming, which is far from being residual, or occupying residual spaces. Over the last two or three decades, in fact, this farming has become ever more specialised, to the point where it produces products of excellence. The ongoing crisis also favours peri-urban farming in the Alps, resulting on one hand, in a significant slowing down in building development and on the other, in an opportunity to recycle the abandoned land, in a situation characterised by the scarce availability of space suitable for urban activities. Furthermore, peri-urban agriculture plays an important role in Alpine space by maintaining biodiversity and supporting eco-systemic connectivity. As concerns the first aspect, it can be noted that agricultural land areas, besides constituting important containers of biodiversity, often interact with other ecosystems, such as the hydrographic network comprising both major waterways and irrigation channels, which, in turn, are important containers for flora and fauna (Ferrari 2014). Finally, peri-urban agriculture, in the Alps, is often based on important networks of actors who, during the last few decades, have organised strong opposition to the transformation of agricultural land, reinforced during recent years precisely as a result of the growing solidity and importance of agricultural practices. The presence of these networks and the effectiveness of their actions acquire ever more decisive weight as they are gradually transformed into forms of organisation able to play a decisive role in fundamental policy decision-making (Peyrache-Gadeau and Fleury 2005; Janin and Perron 2005; Souchard 2003; Corrado 2010). For example, it is well known that land-use policies in the South Tyrol and the substantial defence of agricultural land around the city of Bolzano in particular, can be attributed to the strong influence played by the Südtiroler Bauernbund (the South Tyrolean farmers association) on the Südtiroler Volkspartei (the party representing the German-speaking population) which has governed the Autonomous Province of Bolzano for the last decades (Diamantini 1999). The fact that Alpine peri-urban agriculture can count on important actors implies the possibility of overturning the prospects with respect to what happens in cities on the plains, where agriculture can only play a passive role as its continuity is at the mercy of discretionary urban choices which may or may not be implemented, according to the moods of the city. The Rotaliana-Königsberg territory extends along the section of the Adige Valley that begins immediately to the north of Trento and ends at the border between Trentino and South Tyrol. The city has exerted a pressure on this territory through the suburbanization of some of the city’s population and the creation of large areas for industry and commerce. This pressure, also for the localization patterns and building typologies adopted, gave the Rotaliana-Königsberg valley floor, particularly near the city, an indistinct character with a disorderly mix of mediocre urban areas and anonymous rural spaces. There are still, however, extensive areas of the valley floor covered with vineyards and orchards, together with the entire hill on the orographic left of the Adige River, much of whose largely vineyard-covered terraces has been spared by the urban sprawl (Fig. 1). The relative integrity of these agricultural areas is due only in small measure to the attention paid to them by urban planning schemes, as two different categories of actor have played a decisive role. The first is represented by local farmers organised into cooperatives set up mostly in the mid-1900s for the production and sale of agricultural products. The second includes wine companies and wine makers, which differ for quantity of product which the former obtains also using grapes from third parties. Both categories include the heirs of peasant farming families, often with a good level of education, and other figures such as urban professionals who have opted for a lifestyle change. In both cases, these figures have entered the world of wine, bringing with them new managerial techniques, important innovations and new energies. Agricultural land also constitutes an ecological resource. The vines, as also the fruit trees albeit representing ecosystems already very impoverished by modern agricultural practices, today represent a habitat for birdlife and some species of amphibians, while in its turn the presence in cultivated valley bottom of gullies, especially those with non-cemented banks, provide an enormous variety of ecological, floral and vegetative conditions (Bruno et al. 2011). Finally, the agricultural land represents an open space that lends itself to connecting highly natural environments and, in particular, to the passage across the Adige valley, Fig. 2, of large ungulates and bears as documented by the Trentino Ecological Network Project (Ferrari et al. 2014). Agriculture production and eco-systemic functions interact in open spaces with other functions such as recreational activities assisted by a network of cycling and pedestrian paths that interacts in its turn with functions performed by residential, commercial and productive settlements, constituting a very important part of the local economy, as well as with the transport networks. For a certain period, the persistence of local actors who did not belong to the city, but at the same time no longer belonged to the rural world represented a necessary, but not sufficient, precondition for the survival of peri-urban agriculture. It certainly contributed to defending, although only partially, the character of the places, but in a complete absence of a long-term vision. The latter, in fact, could emerge only through a pact based on the equal dignity of the contracting parties and to be entered into first and foremost with the city. A unique opportunity in this context was represented by the recent attribution of relative autonomy to Rotaliana Königsberg territory (previously denied by its inclusion in the city’s district), including competences in land use planning. By starting to draw up the land-use plan, the local community has emphasized the deep-rooted agricultural vocation of the places remarking a sort of otherness with respect to the city, even if the inhabitants perceive themselves as citizens. The planning project is articulated on three strictly inter-related levels. The first level consists in a set of actions aimed at creating the image of a territory with a vocation that goes hand-in-hand with agriculture. The protection of agricultural surfaces is an important part of such actions, and intervenes through constraints to land use changes—i.e. the prohibition to reduce the total surface of the so-called “worth agricultural land”—enacted to safeguard not only agriculture production but also rural landscape. In is turn, towns development is controlled by appropriate schemes realised according to the characteristics of the individual urban forms. In return, it is promoted the re-use of abandoned buildings and derelict built areas inside towns. The second level is represented by a set of actions aimed at promoting, as suggested by many authors (McHarg 1969; Taylor Lovell 2010; Pinto-Correia and Kristensen 2013; Primdahl et al. 2013), the multifunctional use of the agricultural land. Two areas acquire special importance in this framework: on the one hand, the northern part of Rotaliana Königsberg and, on the other, the hill slopes. In the first area, the presence of large agricultural surfaces not clogged up by settlements and interacting with the minor hydrographic network would support a variety of fauna species as well as acting as an important ecological corridor for the passage of large mammals. In addition to this, it also constitutes a recreational context on account of its landscape values and accessibility. As regards the second area, the features of the landscape, noteworthy for the alternation between vineyards and woodland copses and the presence of historical settlements with their specific recognisability, are an opportunity for integrating wine production and recreational and tourist activities, especially as concerns visits to the numerous wineries distributed on agricultural land. The third level includes all the actions aimed at “slowing down” the utilisation of the area, including that near the city, by recourse to routes and systems for accessing the various agricultural products (alongside wine and apples, high quality horticultural production has also been developed), characterised for their slow speed mobility. The agricultural park has seemed the most suitable solution to implement these actions. An agricultural park, however, different from those promoted by lowland cities policies, aimed above all at creating green infrastructures in urban areas (Timpe et al. 2015). The agricultural park included in the legislation of the Autonomous Province of Trento has in fact different purposes, such as the promotion of an agricultural production not detrimental to natural processes, the preservation of the rural landscape and the promotion of products, image and enjoyment of the places, consistent with the characteristics and the meaning of agricultural production in the Alps, included peri-urban production. The agricultural park requires to be implemented a specific project, the drafting of which involves the farmers; the project defines, in particular, how to manage and multi-utilize different agricultural areas, so becoming the main instrument of implementation of the plan which thus would lose its passive effectiveness. In the Alps, metropolitan functions should coexist with the physical and cultural traits of a mountain territory. In other words, the Alpine city, even in performing advanced functions, should maintain its specific identity that derives from being an integral part of an absolutely singular environment and of a natural and anthropic landscape local inhabitants strongly identify with. Peri-urban agriculture has to play a crucial role in this perspective. Contrary to what happened in cities on the plains, peri-urban areas in Alpine contexts do not appear to have been compromised by urban development that has characterized the last few decades. These areas, in fact, present vast agricultural surfaces that, besides fulfilling an essential productive function, also carry out eco-systemic functions and contribute to the landscape composition. Settlements within these areas are still arranged in an orderly fashion and fulfill functions determined by their proximity to both the city and the countryside. Peri-urban agriculture land is currently claimed by, on the one hand, building processes that radiate from the city, propelled exactly by its expanding functions, and on the other hand, by practices—specialized agriculture in particular—that successfully secured a relevant space for themselves within the local economy. The survival of these practices is thus put in jeopardy. The article listed three main conditions for the correct management of peri-urban agriculture in the Alpine space. The first condition concerns the decision-making process. In other words, who decides about the future of agricultural land? Generally, within urban growth processes—and metropolitan growth processes in particular—it is the city that decides on the future of peri-urban areas, assigning them residual functions and a spatial organization suitable to such functions. Hence, attention towards nature may be limited to the greening of the built city and to the retrieval of interstitial spaces in the peripheries, while open peri-urban areas remain the target of real estate speculation. This decision-making process needs to be inverted. Subjects who operate in peri-urban areas should be put in the condition to decide, and a dialogue with the city to be established in order to maximize shared interests, the most important of which is keeping specific urban traits within a processes of sustainable development. This is made possible by a rooted tradition of self-government that is typical of the Alpine region, in combination with the special attention such regions devote to as scarce a resource as usable soil. As a result, the administrations of the towns adjacent to the city, although small, enjoy a certain degree of autonomy, or an authority that extends its jurisdiction on the city as well as on the surrounding territory may intervene in the management of territorial processes. The first scenario applies to the peri-urban areas around Trento, governed by administrations such as the Comunità di Valle (Valley Communities), while an example of the second instance would be the city of Bolzano, where agricultural terrains extending beyond the city lie under the protection of the Provincial government. In other cases, such as Grenoble, local actors (in this case farmers) replace an autonomous form of government in negotiating important territorial decisions with the city. This scenario becomes even more concrete if the decision-making relies on solid economic and social grounds: in other words, if peri-urban agriculture is deeply rooted in the local culture and tradition. This is where the second condition comes into play. The presence of an innovative agricultural system whose quality products may compete on the national and international markets doubtlessly represents a strength factor. In the case at hand agriculture has evolved so substantially over a few decades that nowadays its wine and fruit production appears to be mostly exported. This fact also shapes the image of the territory, which came to be associated with a local wine brand. As pointed out, this evolution is the result of the joint effort of different actors. First and foremost, wine cooperatives, which over the years successfully consolidated, parallel to their economic role, a political role that allows them to actively influence political decisions that, in line with the territorial plan, fall upon the Valley Community. The third condition is that, when deciding upon the territory, organisms and actors that represent the interests of peri-urban areas take into account the point of view of the city as well. The absence of this condition could cause a conflict on land use with unpredictable outcomes. What may be of help in these circumstances are the latest approaches to the topic of open spaces and the solutions they propose, especially their considerations on the services offered by the presence of ecosystems, including agricultural ones. In the case at hand, the productive function of agriculture interacts with its function of habitat and space of transit for numerous animal species. In addition, the presence of farm roads and cycling lanes allows agricultural lands to function as recreational areas for the city’s inhabitants. Finally, the attractiveness of a place or landscape results in tourist flows from which the city can benefit as well. 40410_2016_44_MOESM1_ESM.doc Additional file 1. Short curriculum.